Guess what? Learning to read is important. You’re probably thinking, “No kidding.” But are you actively do anything to propel the process along? Or are you simply waiting for your son or daughter to learn from an educator the basics of the English language? The truth is that many parents and guardians who innately understand that literacy is a key factor to lifelong business, interpersonal and intellectual achievement do not always prepare their children in the home. It’s not out of a deliberate or malicious intent; in fact, it’s usually driven by the reality that busy families often do not have much free time to spare. Whether you’re reading the newspaper or simply pouring cereal from a box, point out letters to your child. Even infants enjoy being shown their ABCs, even if it seems as if they cannot possibly understand what’s going on. By introducing your son or daughter to the basic characters in his or her tongue, you’ll be setting the stage for reading to begin. You don’t have to buy pre-made flashcards to have fun with word recognition. If your child is at the point where he or she can remember a few simple words such as cat, dog, or toy, you can assist him or her by taping a picture of the object on an index card. Then, on the back of the card, write the word. 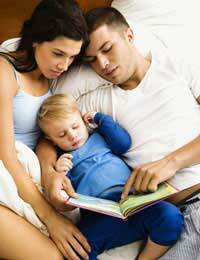 That’s five minutes – full minutes – of uninterrupted time to spend on reading with your child. Make sure there are no distractions around you. (Turn off the phone and the telly for starters!) Then, just sound out words together. Or work on the alphabet. These moments will actually serve a two-fold purpose: your child will learn to understand his or her language and the two of you will have a few moments to “bond”. When was the last time you and your son or daughter drew together using crayons, pens, pencils, markers or paint? If it’s been a while, get out the art supplies and help him or her “write” something simple, like a few letters. Often, kids get the wrong impression about writing and hate to practice; however, if you make it fun and “artsy”, they’ll be more likely to enjoy the process. Using wooden or plastic blocks with letters on them (available in almost any toy or learning store) or pieces of paper with hand written letters, why not build words? For instance, if you line up the letters “R”, “A”, and “T”, your child will hear (after you say the word) that the combination of characters equates to the word “RAT”. By changing the first letter to “H” and explaining the word is now “HAT” (which rhymes with “RAT”), you can help him or her understand a variety of sounds and also learn to “sight read” shorter words. The more creative you can be, the better! So be certain to try new ways of getting your child(ren) ready for a lifetime of literacy.